Generate Visa credit card number with CVV and Expiry date! How to get a Visa card number? The vast majority of Visa debit and credit card numbers start with 4 and is 16-digit long. however, a few Visa account ranges using a 13-digit format, The credit card number must pass the Luhn Algorithm Check. Every Visa card number has a specifically prefix like: 4539 4556 4916 4532 4929 4485 4716. Visa Inc is an American multinational financial services corporation. 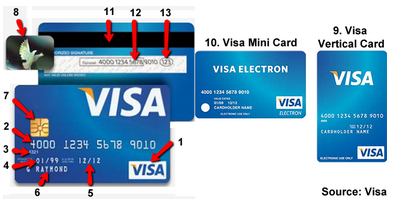 The vast majority of Visa credit card numbers start with 4 and are 16-digit long. The format like this: "4xxx xxxx xxxx xxxx".